These welcome animations may be used on any personal or educational web site but may not be included in any collection for redistribution. Welcome on black with animated stars. Welcome - It's So Good To See You. Welcome animation with flashing colors. Welcome animation with horizontal spin. 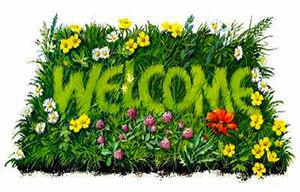 Welcome with grass and flowers. If you save and use our welcome gif animations please give us credit. Thank You. Animated welcome clipart, animations, free welcome animations, welcome gifs, graphics, green, yellow, red white, black, stars.